*Personalized departures available. Use our concierge service to plan based on your dates of travel and preferred hotels. Choose your dates and let us do the rest. Any day of the week, any month of the year! What makes our trips special? We do all the work. All you have to do is pack. You can join one of our groups or create your own. Departures are guaranteed for personal departure dates. Our advertised prices are for group of 4 or more people traveling together. If you are a private group, prices are provided based upon request. Try this sample itinerary or ask us to create one for you especially for you. *All prices in US dollars. In the morning our guide will pick you up in Florence for a transfer to San Quirico. After a typical Tuscan lunch in the medieval village of Montalcino, your guide will take you for a walk through ancient Roman roads that pass through the Brunello vineyards for which the region is famous. There is time before our welcome dinner to relax by the pool, weather provided, or sip a glass of local wine before dinner. Tuscany is best known for its art, history, food and wine. Today has it all. We begin with a hearty Tuscan breakfast. Next, walk to the picture-perfect Sant’Antimo for a visit to the Benedictine monastery. We’ll walk through cool forests and rolling hills covered in olive groves and vineyards. If you’re lucky, you will come across grazing chianine – white cattle weighing up to one ton. Sant’Antimo is a Romanesque Abbey that dates from the 12th century. The monks still chant at specified times. A picnic lunch will be included today as well as a tasting of the famed Brunello wines. End the day in Pienza, a renaissance town with initial construction by decree of Pope Pius II. In contrast to the narrow alleyways of medieval towns, the original design of Pienza placed an emphasis on making the blue sky visible between buildings. During your two-night stay in Pienza, you’ll have a chance to visit local cheese shops that specialize in pecorino – pungent cheese made from sheep’s milk. Mmmm! Dinner is on your own tonight and the choices are plentiful. We begin with an early morning walk to the village of Montichiello. Afterwards, there is a car transfer to Montalcino, known for its rich Sangiovese Vino Nobile. 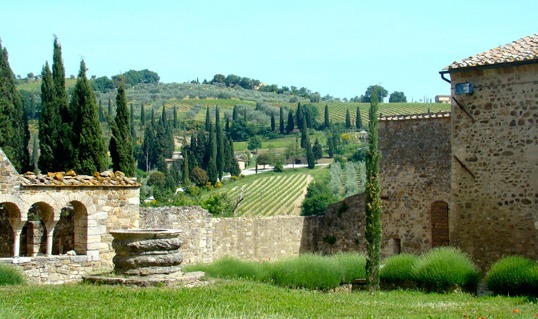 We will take a walking tour of Montepulciano and of course taste some of the local wines. Today you are treated to a guided walking tour of Cortona and the surrounding hills made famous by Frances Mayes in Under the Tuscan Sun. Visit the Etruscan museum. The Etrurians formed the basis of what we know today as Italian food and family culture. They bred the first chianine, white cattle weighing nearly one ton and famed for Florintine steak. Tonight you’ll share a farewell dinner in the company of your guide. After breakfast, our guide will transfer you and your luggage back to Chiusi train station. Transfers to Florence can be arranged upon request. INCLUDED: 5 nights accomodations at deluxe hotels, all breakfasts, 3 dinners, 1 lunch, wine tasting, full time certified local guide, luggage transfer, all hotels transfers, guided walking routes, hotel taxes and tips, ferry to Capri, archaeological expert in Pompeii, tips and gratuities for included meals & hotels, and more. NOT INCLUDED: Airfares, airport taxes, travel insurance (mandatory), pre and post trip arrangements, personal purchases, mini-bar services, alcohol unless specifically included, taxes, FICAV contribution, tips for the guides. * Personalized Departure Dates: All trips can be organized to suit your individual needs and preferred departure dates. Supplemental charges may apply.